Ten ringers: Anne, Carroll, Eoin, Jim, Jody, Judy, Marguerite, Nancy, Rob, Thomas. We raised all eight bells. Nancy’s son visited to observe, and I believe Amy and her son came partway up the spiral stairs to observe for a bit. This was the first ringing session since the galvanized gutter and its wooden supports were taken down, and the bells sound better now. The difference in the sound is amazing: clearer, brighter, more defined. Rounds and Call Changes on six, then on eight, called up by Rob from the treble. He double-called many of the changes to be sure that all the ringers involved knew what to do. 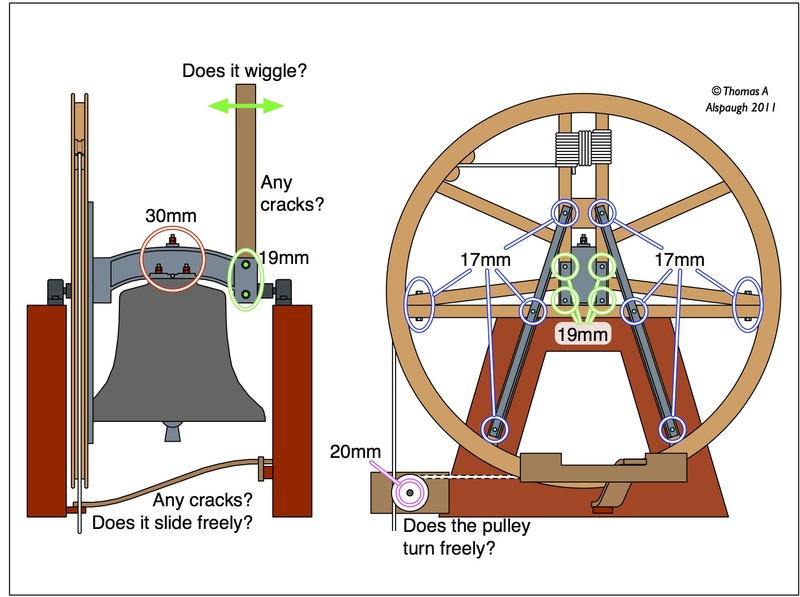 We placed strong ringers on the tenor, treble, and the first bell of the back half (the 5 when ringing on all eight) to carry the band through any rough spots; the 5 anchors the back four (5678) and a well-placed blow in 5ths helps keep the back bells steady. Rob called the changes in a pattern that kept strong ringers in two of those three places (leads, 5ths, 8ths) most of the time. We ended the last group of Call Changes by ringing down in peal. Everyone gave their best effort and the band struck better and sounded better than I have ever heard them—well done, all! 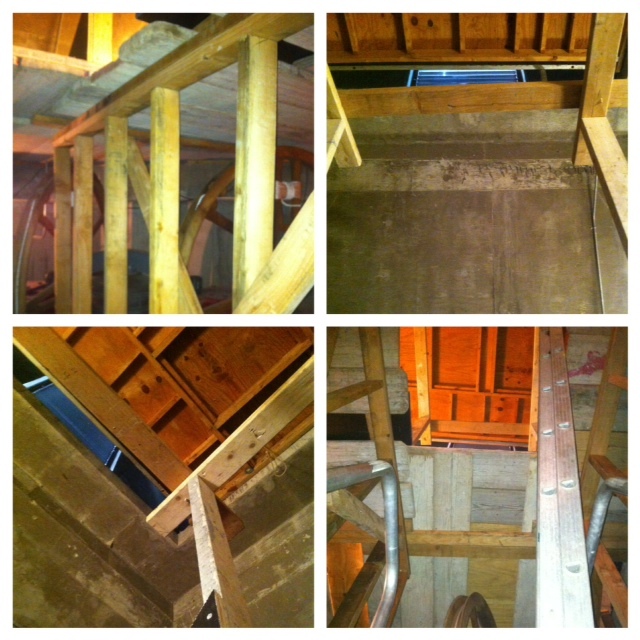 Rusty galvanized gutter is no more! Jim reports that the workmen removed the rusty galvanized gutter above the bells in the ringing chamber today (2013Mar27We). The gutter had long since stopped keeping water off the bells, and instead had been shedding rust flakes and chunks of rusty metal onto the bells and (more recently) into the rain awning. Photos of the extensive scaffolding they set up above the bells are below. The scaffolding will be taken down by Saturday night so the bells are ready for Easter service ringing. Once the scaffolding is down we’ll put the rain awning back up to keep the bells dry. This job was too big for the ringers to handle safely themselves. We thank the generous anonymous donor who made this possible. Eight ringers: Barbara, Eoin, Jim, Jody, Judy, Marguerite, Rob, Thomas. We raised all eight. We had five observers: Barbara’s younger son Liam, Bobbie and her sister-in-law, and Amy and her son. Rounds and Rotate on Seven, then Eight. For our service touch we rearranged into a good allocation of ringers to bells (strong ringers on the treble and tenor to keep the band stable, a strong ringer on the 5 to help the back four stay even, a ringer with a good ear on the 2 to help set the pace, and the weakest ringers separated) and rang Rounds on Eight beginning about 9:40. After the rounds had settled fairly well Rob called a few changes on the back four, and we rang down in peal. Early Practice · Four ringers: Carroll, Lynn, Nancy, Thomas. We raised 1234, then the 5 and 6 as other ringers arrived. Rounds on Four, aiming for everyone to be counting. Practice · Seven ringers: Carroll, Judy, Lynn, Marguerite, Nancy, Rob, Thomas. Rounds and Rotate on Five, then Six. We were all happy to see Marguerite ringing again. Rob showed everyone the color possibilities for the new bellropes and got opinions. Bobbie · It’s been a couple of weeks since her last class. Bobbie is too tense in her wrists and elbows but otherwise is progressing well. She continues to think everything through, which frustrates her because it takes longer but will serve her well over the long haul. Raised the 4, with help from the Thomas. Backstroke form · She worked on backstrokes alone to help ingrain her good form further, so that it will be there when she is concentrating on both strokes together. Handstroke form · Some problems, as with most learners: not enough follow-through, wrists and elbows too inflexible, motion not smooth enough. She tends to “glue” her elbows to her ribs as her arms come down, which makes her throw out during the remainder of the stroke. She rang both strokes together but not for lengthy runs of strokes. We worked on keeping her wrists open to allow her arms to stay flexible. Her motion bringing her hands up, both strokes, is too stiff. Consequently she loses track of where the bell is and the rope bounces about. All this is fixable and she is determined. Next class will be after Easter. The 6’s rope boss fell during service ringing today. Fortunately Thomas had the hammer drill and concrete bits in the trunk of his car, and boxes of several screw-anchor sizes in the tower supplies, so the problem could be addressed immediately. Carroll, Nancy, and Thomas stayed on to put the boss back up. We examined the boss and discussed the situation. This boss has had to be reinstalled already. Its mounting holes were not drilled straight or uniformly and the 3⁄16″ anchors, the only standard size that would fit them, do not grip sufficiently. Thomas had already tried taping them for a tighter fit. We decided the best course was to carefully redrill the holes with a ¼” bit, deepen them to accommodate the longer ¼” anchors, and remount the boss with the corresponding anchors and screws, which are larger and longer. The 6 was still up. 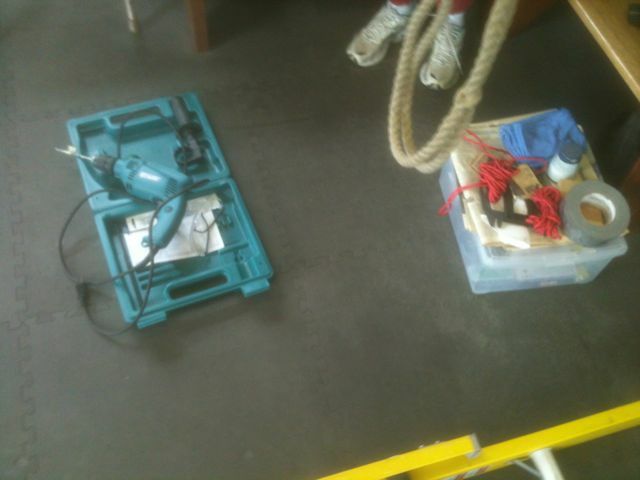 For safety, we pulled its rope upstairs into the intermediate chamber and sheepshanked it to keep it off the floor and clean. 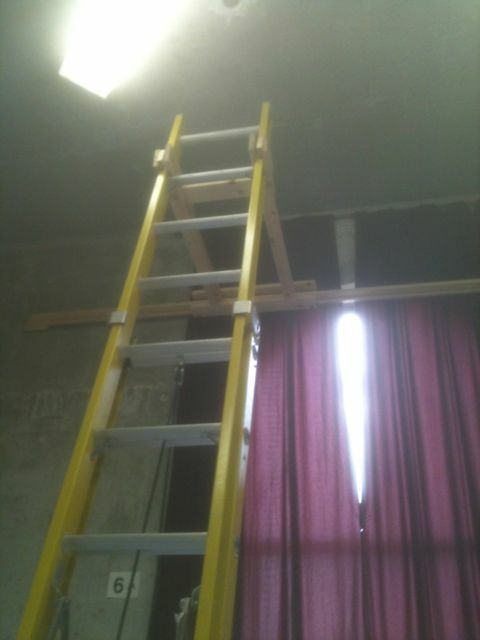 We assembled the ladder standoff and mounted it on the ladder. We carefully redrilled the holes to ¼” diameter and the depth required for ¼” anchors. We checked that the anchors fitted (they did), aligned the rope boss to the proper rotational orientation (only one of the three choices works), and screwed it in place. 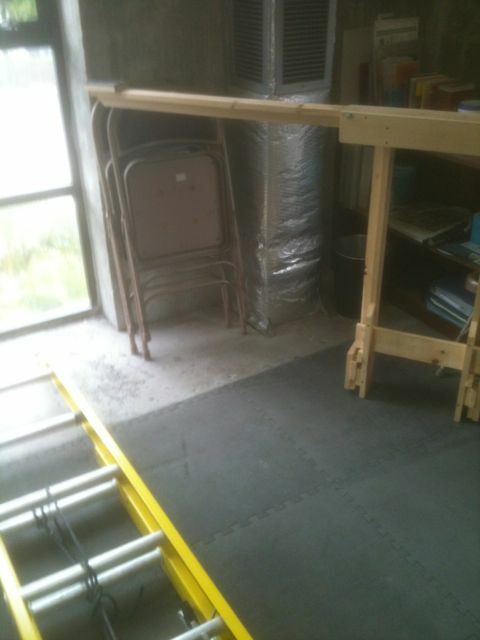 We took the ladder down, disassembled the standoff, and stacked everything away back in the corner. We lowered the 6’s rope back down into the ringing chamber. By now it was 11:05am. When the service let out at 11:15 Thomas rang the 6 down.